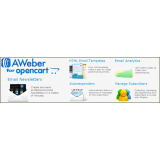 AWeber Email Marketing extension allows you to replace the default OpenCart newsletter with a more robust and professional email marketing service. You can use it for newsletters, email campaigns, auto-responders, targeted emails, mailing list, ezine and even direct email blasts to all your customers. There is much more than you ever thought was possible to do legally on email! Don't 'monkey' around by letting a chimp manage your marketing campaigns! Using AWeber gives you confidence that your email will not be viewed as spam and actually make it to your customers inbox. Right now, there are over 102,000 businesses like yours that are raising profits and building customer relationships by using the AWeber opt-in email marketing software... they've been doing it for 10 years now, isn't it time to get started? Visit the link to get a $1 Trial Account - Cancel Anytime! You will be charged $1 for your first month - No Risks! - integrates into open cart front end without changing anything (uses regular subscribe box). - Turn extension ON or OFF as needed (turn it off to use the open cart default newsletter function). - Have all your new customers subscribe by default (it's set to OFF when you first install it). - Admin. can edit customers email address, name and even turn subscription ON / OFF manually. - To avoid spamming, when the admin turns subscription on, the customer gets a confirmation email. - [NEW] Updated plug-in to be COMPATIBLE with MORE VERSIONS of OpenCart (works with: 1.5 to 1.5.4.1). - [NEW] IMPROVED installation process and CODE for better performance. - [NEW] MODULE to DISPLAY SIGN-UP FORM anywhere on the cart to get more subscribers. - [NEW] MODULE has the ability to DISPLAY SUBSCRIBER COUNT. - [NEW] MODULE removes sign-up form and DISPLAYS CONFIRMATION MESSAGE if subscription was successful. - [NEW] GUEST checkout now has MISSING option for SUBSCRIBING (this alone justifies extension cost)! - [NEW] GUEST checkout also works with SUBSCRIBE BY DEFAULT feature. - [NEW] Admin can manually ADD or REMOVE SUBSCRIBERS. - [NEW] Admin can VIEW SUBSCRIBER LIST including name and email with ability to filter the list. - [NEW] Admin can FILTER the list of SUBSCRIBERS to easily find any subscriber. - [NEW] Admin can activate MODULE to display SIGN-UP FORM anywhere on site. - [NEW] Admin can configure module to SHOW or HIDE SUBSCRIBER COUNT. - [NEW] Admin can configure module to make NAME field REQUIRED, OPTIONAL or OFF. Installation document includes step-by-step instructions with screen captures to make it easier on beginners. This includes how to get and use the free VQMod extension, which you should already be using in your shop.